As the highest stadium in Europe, the Ottmar Hitzfeld stadium gets first place on this list. Sitting at 2,000 metres above sea level, you have to either take a cable car or make a day of it with a mountain hike in order to get here. The pitch is based in Gspon, a small town in the mountains near Zermatt. Being the only available area of free space with the potential for a football pitch, this pitch is not quite the full size and due to the altitude, the grass is artificial. However, the spectacular views over the Alps more than make up for this. A safety netting around the edge of the pitch is a necessity thanks to the steep drop on one side that has gobbled up many an enthusiastically kicked ball. Swiss side FC Gspon claim to go through a lot of balls this way. The altitude also acts as a benefit to the club though, as visiting teams less experienced to the thin air up high may struggle somewhat in a 90-minute game. 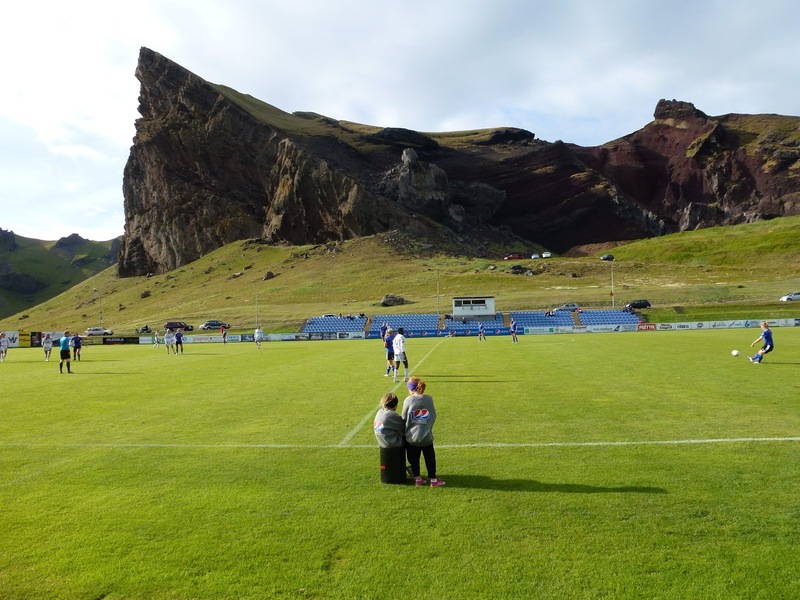 Not many clubs can say that their home ground is situated next to a volcano, but for IVB, one of Iceland’s top division clubs, this is their surprising reality. The result is dramatic rock formations overlooking the ground make it quite hard to forget the volcano looming just behind. IVB stands for Íþróttabandalag Vestmannaeyja (yep, us neither) and the team have won the Icelandic league three times. Now that Iceland’s national team is up there on the global stage, the Hásteinsvöllur Stadium may find increasing numbers of fans turning up next season! Granted the title ‘stadium’ may be a bit kind here as it’s essentially just a pitch, but we’re not all that picky. At 1,000 metres above ski level, it’s the second-highest pitch on our list. 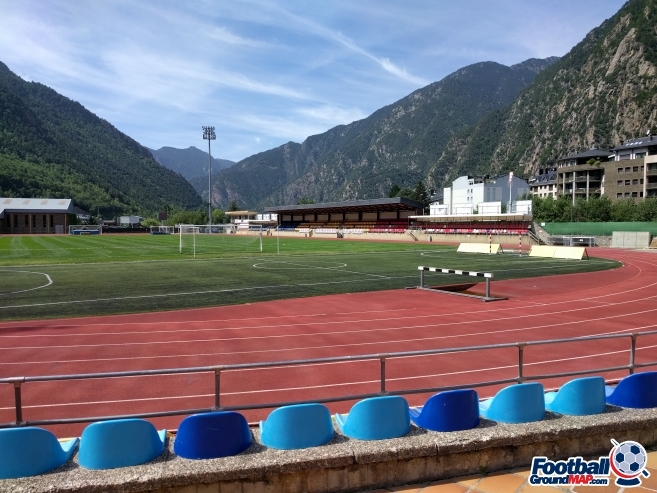 Set in Andorra’s capital city, Andorra la Vella, this stadium benefits from the stunning surrounding mountain landscape of the Pyrenees. For many years it played host to Andorra’s international games, with teams such as the Netherlands, the Republic of Ireland and even West Ham having played here! While no longer the home of Andorra’s national team, the stadium remains a staple in Andorran football. It’s now one of three stadiums used to host matches from the Andorra’s football league system’s two top tiers. Located on the banks of the river Rhine, overlooked by the Alps and just metres from the Swiss border, Liechtenstein’s national stadium has a lot to offer when it comes to location! This stadium has quite possibly the most incredible views of all the stadiums in this list (and that is saying something). A recent image doing the rounds in Instagram taken by Amaury Moran shows a view from the stands that almost looks photoshopped. The stadium is located in Guadalupe, Greater Monterrey, and is home to the team C.F. Monterrey. It was opened in 2015 with a capacity of 51,00 before being expanded in 2016 to a capacity of 53,500. However, there have been questions as to whether the stadium’s location could be having detrimental effects on local ecology and wildlife. Set in the town of Tasiilaq in eastern Greenland, the Tasiilaq stadium has an incredible backdrop. The area is volcanic, explaining why, with dimensions of 90×65 metres, this pitch is the single largest piece of flattened land in the area. Built in 1960, it has never reached full international size or gained a real grass surface and spectators often sit on nearby rocks to watch games, but this all just adds to it’s charm in our opinion. We just love how it sits between these almost toy-like coloured houses, overlooked by the snowcapped peaks of the Qimmeertaajaliip Qaqqartivaa mountain behind. With a population of around 2000, Tasiilaq is Greenland’s seventh largest town. After Iceland’s unprecedented success at the Euros in 2014, perhaps Greenland is the next team we should be keeping our eyes on!